Super simple salad & so delicious. I threw together this tasty & satisfying salad on the fly this afternoon. In just a few minutes, you have a completely balanced, nutritious meal – greens, protein + healthy fat. Grab 1 large handful of spinach + 1 small handful of arugala & chop. Place in bowl. Onion: I used 3 thin slices & cut in half. 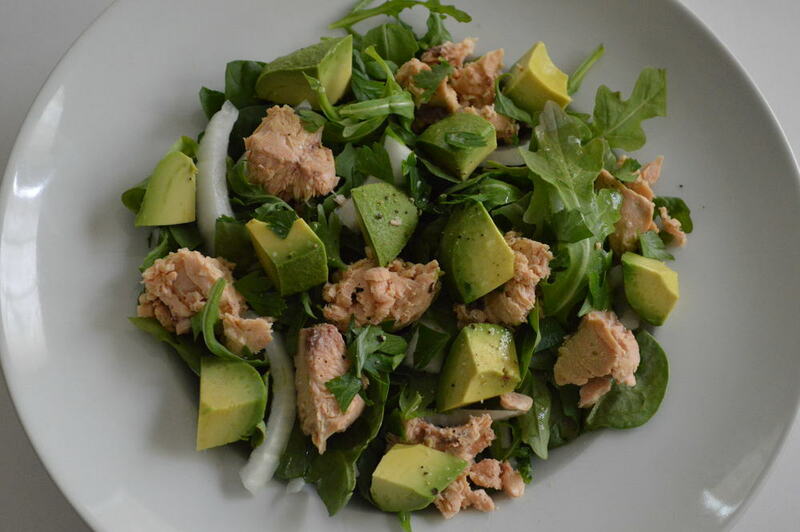 Salmon: pop open can of salmon, drain, spoon out & place on top of greens. Avocado: 1/2 an avocado. cut 3 slices length wise & 4 slices width to get nice, chunky squares.